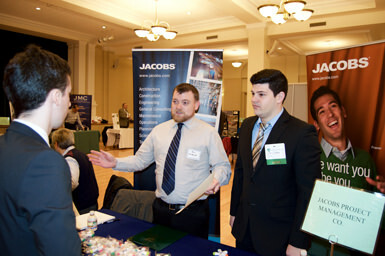 We offer several different career fairs throughout the year. There are four career fairs/expos throughout the year that bring to campus employers looking for enthusiastic and engaging students from ALL majors. Be sure to review the firms ahead of time on Handshake, bring your best questions to ask employers, and dress professionally. Plus, our career fairs are a lot of fun, too! We have raffle prizes, a best-dressed contest, and a professional photo booth where you can take a headshot to use on your LinkedIn profile. All Manhattan College students and alumni are encouraged to attend! Focusing on jobs and internships for all STEM disciplines. Focusing on jobs and internships for the O'Malley School of Business and School of Liberal Arts. This event targets students interested in infrastructure, safety, renovation, restoration, project management and the construction industry in general. Focusing on jobs and internships for all schools and disciplines. Focusing on jobs and internships for the School of Education and Health and all students interested in working with children and youth. Watch "A résumé expert reveals what a perfect résumé looks like". Have your resume approved by a Career Counselor or a Peer Career Advisor during walk-in hours or schedule an appointment at 718-862-7224. Get your professional business attire (i.e. suit, white collared shirt and tie). Need to see what to wear or need to borrow a suit? Visit our clothing closet and watch “"What to Wear to an Interview..." for Women” and “"What to Wear to a Job Interview" for men” on YouTube. Review the list of who's attending and make note of the companies that interest you. Categorize employers who interest you and those you “must visit”. Watch the "Researching the Company" Video on Vault. Visit Glassdoor.com to research company reviews, interview questions, and salary information. Go on LinkedIn for recent updates, employee profiles, job/internship opportunities. Pick up a copy of the floor plan and review it to familiarize yourself with the layout of the events. Wear your name tag and don’t forget to include your school and major. SuitUp! Wear professional interview attire; which includes a business suit, collared shirt and tie (men) and dress or blouse and skirt/pants (ladies). Take your professional headshot at the LinkedIn photo booth. Get contact information from recruiters and alumni that you would like to follow up with after the Day. Remember, they will pay attention to the students who thank them and demonstrate interest after the event. If there is a line, pick up brochures and network with other companies. You can always return later. Your goal is to demonstrate your interest in the company and share your educational background as well as personal skills and strengths which would make them interested in hiring you. Keep your body language open and welcoming. Demonstrate that you’ve researched the company by including elements of their mission statement, history and/or company culture. Shake hands, make eye-contact and smile with employers. Get recruiter’s contact information to follow up and send a thank you. Send thank you emails or letters after the career fair in a timely fashion. Don’t send a standard thank you to everyone. Include your interest in each particular firm and remind them of details you discussed in the conversation. Review sample thank-you letters and emails and watch “Job Interview: Follow-Up” on Vault.